The Food for Learning group is reminding motorists in downtown Picton this month that while parking might be free, groceries are not. 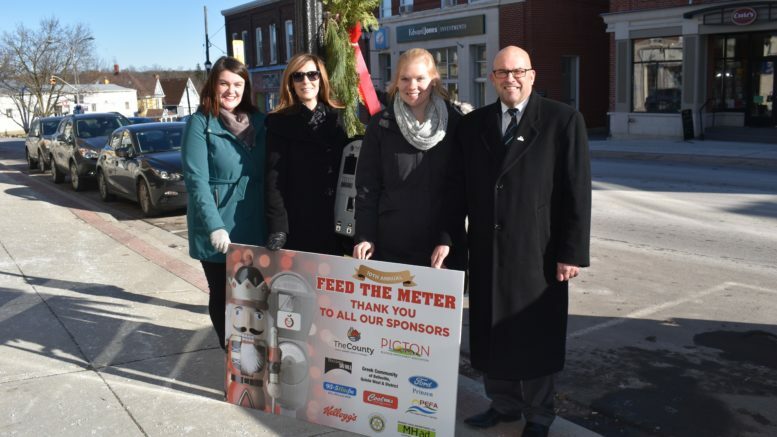 The Hastings and Prince Edward Learning Foundation’s 10th annual Feed the Meter campaign in Prince Edward County formally kicked off on Tuesday as Foundation members and Prince Edward County Mayor Steve Ferguson fed a meter in downtown Picton. 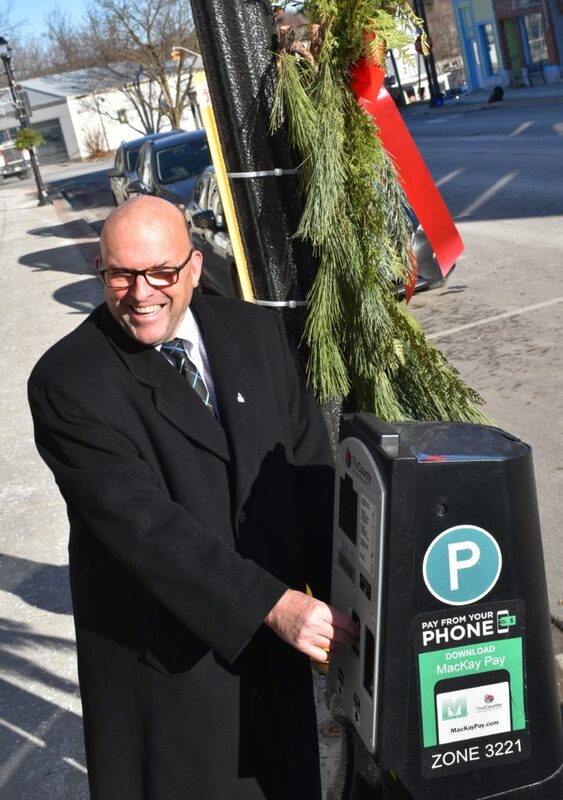 While parking in the downtown core is complimentary during December, shoppers are asked to drop loose change into the meters in order to support local student nutrition programs in Prince Edward County schools. Breakfast clubs, snack breaks and lunch programs are supported by Food for Learning. The Feed the Meter program is also underway in Belleville and Trenton. “The goal of student nutrition programs is to ensure that all students have daily access to breakfast, lunch and/or snacks while at school. When students eat better, they are engaged in their learning, experience a sense of belonging at school and develop lifelong healthy eating habits,” Food for Learning coordinator Kellie Brace said. By feeding the meter and supporting Food for Learning this holiday season Prince Edward County visitors and residents are helping to provide food to local students. “We know that students in our area arrive at school hungry for a variety of reasons – poverty, rushed mornings, long bus rides, etc. Regardless of the reason, we aim to minimize hunger faced by children and youth in our community. The support received through the Feed the Meter campaign makes this possible,” Learning Foundation Executive Director Maribeth deSnoo added. In the 2017-2018 school year alone, Food for Learning programs provided 1,076,531 meals and snacks through student nutrition programs at schools in Hastings and Prince Edward Counties and all proceeds of the Feed the Meter campaign will be returned to the schools in the communities where the funds were raised and will be used to purchase groceries for the various programs in those communities. Over $4,000 was raised through meter collections and donations in Picton last winter and this year’s regional goal for the Feed the Meter campaign is $30,000. The Feed the Meter campaign is supported through the contributions from campaign sponsors Batawa Ski Hill, Market High Advertising LTD., Greek Community of Belleville Quinte West and District, Starboard Communications and Kellogg’s. Locally, the Picton BIA, The Corporation of the County of Prince Edward, Prince Edward Federation of Agriculture, Prinzen Ford and Rotary Club of Picton support the initiative.